A couple days back I reviewed Vienna, which is a great and complex RSS application. 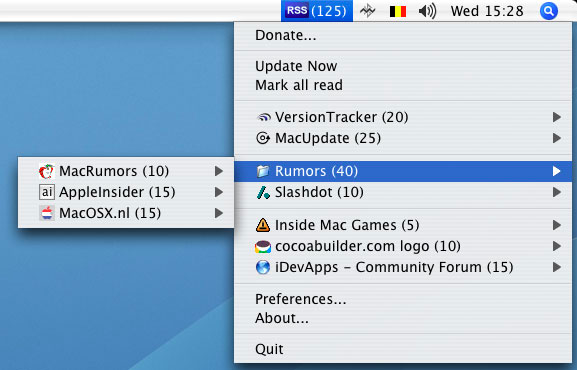 Today, I have discovered an even easier way to get your RSS feeds, all in the Menu Bar. RSS Menu allows you to configure certain RSS feeds for updates periodically, and also has a folder with your iTunes podcasts. The latest release of RSS Menu, 1.6.2, also lets you venture in Safari RSS feeds that your have already saved. RSS Menu makes it so easy to view RSS articles, and most of all, you don’t have to open an application to view the feeds, unlike Safari, Vienna, and Firefox. RSS Menu is donation-ware and is a Universal application. Go to the developer’s site now for a free download.